The Recovery Couch, by Winco Manufacturing, is a low level resting area for exam room patients who can rest easy when feeling ill or injured. This table is a valuable tool that is useful in any facility infirmary, school nurse station, or doctor's office. It is sturdy, comfortable, and easy to clean. The Recovery Couch will prove to be a valuable piece of healthcare furniture for years after purchase. The Recovery Couch has several features and qualities that enhances overall patient care, one of them being the soft comfort for padding. The thick pad is made of medium density foam and has a thick vinyl cover for protection and color. The pad is two inches thick and gains several more inches for head elevation at one end to simulate a cushion. The vinyl cover is offered in a number of color choices. See the adjusting table color selection sheet and send to Vitality Medical. The Recovery Couch frame is extremely durable and strong as it is constructed of high grade steel. The table includes a paper holder to roll out exam paper as needed. And like its cousin, the Treatment Table, it also includes four legs reinforced by cross beams. It has a center beam to support each of the leg pairs. For the SH model, there is instead a metal platform that connects to the leg pairs and rests over the cross beams for support and for storing items. The frame also has leveling feet that can be adjusted to be flush with the ground and to prevent wobble. 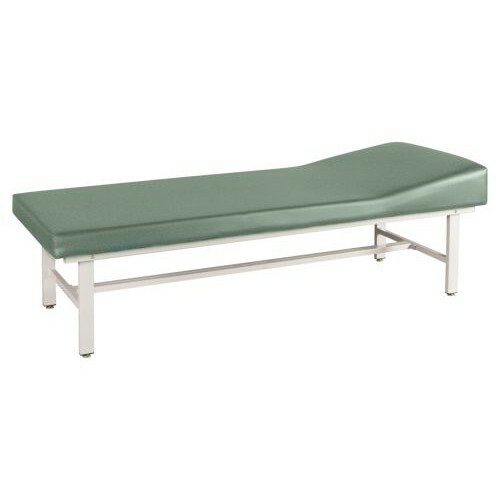 The couch is a good tool that is useful in any facility infirmary, school nurse station, or doctor's office. The couch is low profile and easy to climb onto. The padding is thick and has a protective vinyl cover. There is a number of color options for the vinyl cover. The frame is made of high quality steel with powder-coat paint. The SH option provides a shelf under the resting pad.